As Oswego County celebrates its bicentennial in 2016, the Richardson-Bates House Museum welcomes visitors to come in and learn more about local Victorian-era culture. 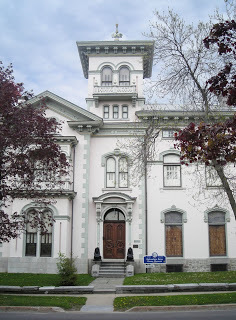 Richardson-Bates House Museum in Oswego, N.Y. The beautiful Italianate Villa-style home was built between 1867 and 1890 for Maxwell Richardson; local attorney, real estate developer, and two-time mayor of Oswego. It remained in the family until 1946 when it was donated to the Oswego County Historical Society. Today, it features period rooms with 95 percent of the home’s original furnishings, much of it preserved as the family knew it. The exotic and opulent furniture and decorative arts provide a unique glimpse at Victorian America’s fascination with history, arts and culture, education, and travel. The museum also houses the society’s collection of nearly 25,000 artifacts, documents and photographs that trace the history of the area and also displays permanent and changing exhibits. One such exhibit highlights the Richardson Theater in Oswego and includes photos, props, lighting, floor plans and architectural blueprints, various memorabilia and a scenic theater drop. In the early 1800s, there were limited theater opportunities available to the Oswego community. As cultural activity increased, professional productions were held in various halls around the city. In September 1875, the completely re-modeled Doolittle Hall opened as the Academy of Music and, for nearly 20 years, featured many significant stars of the day in various productions. Richardson Theatre as it looked in 1909. 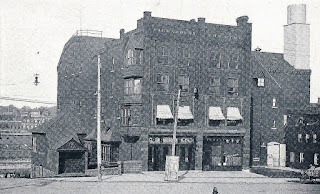 Then, in January 1895, the Richardson Theatre opened at the corner of East First and Oneida streets in Oswego. It was a state-of-the-art facility, equipped with all of the latest innovations of the time. The four-story brick building featured a domed ceiling, was lit with gas and electric lights, equipped with 25 permanent sets and provided seating for 1,400 people before its massive stage. The opera “Robin Hood” launched the theatre with a sold-out show and, over the next 50 years, more than 5,000 performances featuring the most popular performers, musicians, orchestras and bands graced its stage. In 1897, the first silent movie was shown, followed by the first “talkie” in July 1912. In the 1920s, film began to overtake theatre as a means of entertainment and professional performances at the theatre declined, leading to its darkened stage from May 1930 to January 1931. The theatre re-opened from January to December of 1931 thanks to a contract with Warner Brothers to present a series of first-run movies. Sadly, it wasn’t enough to save the theatre and, for a variety of reasons, it closed in 1932, never to re-open. Oswego’s premiere theatre was finally demolished in 1945. At the turn of the 20th century, a new art theatre movement taking place in Europe crossed over to the U.S. and community theatre was born. In 1938, Frances Marion Brown and fellow thespians founded the Oswego Players, making it now one of the oldest continuously-run theatre programs in the country. 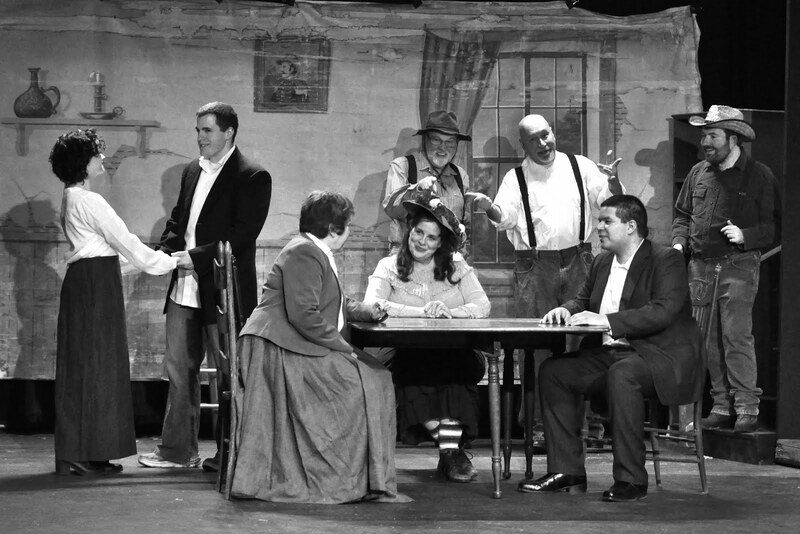 A testament to true community theatre, the Players attract cast and crew from around the county for a variety of productions run throughout the year. 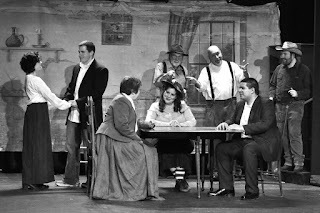 Oswego Players' cast prepares for "Way Down East" production. Image courtesy of Rick Sivers. 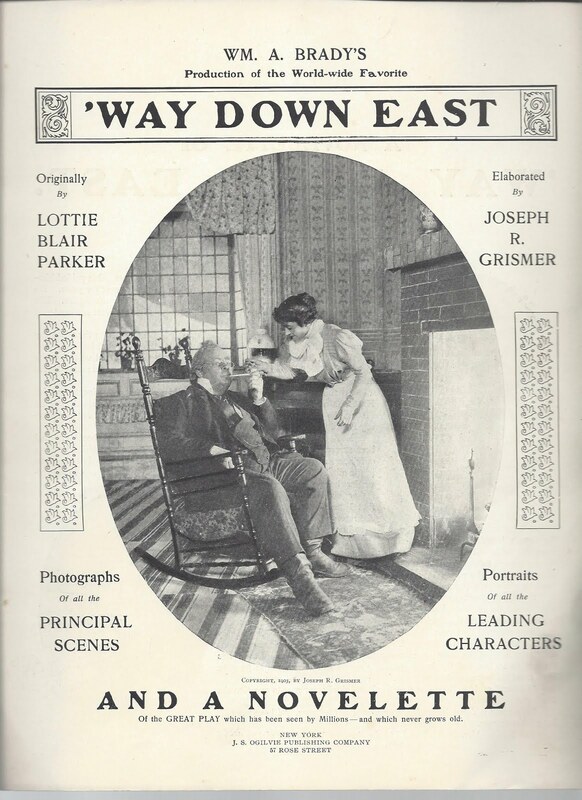 For the next two weekends, the Oswego Players will mark the county's bicentennial with their premiere of “Way Down East,” a melodrama written by Oswego native Lottie Parker. Image courtesy of the Oswego County Historical Society. Parker was born Charlotte M. Blair in 1858 to Captain George and Emily Blair of Oswego. She graduated from Oswego High School in 1870 and the newly-formed Oswego State Normal School in 1872. She began her career as a teacher; however, the lure of the spotlight drew her to the stage. 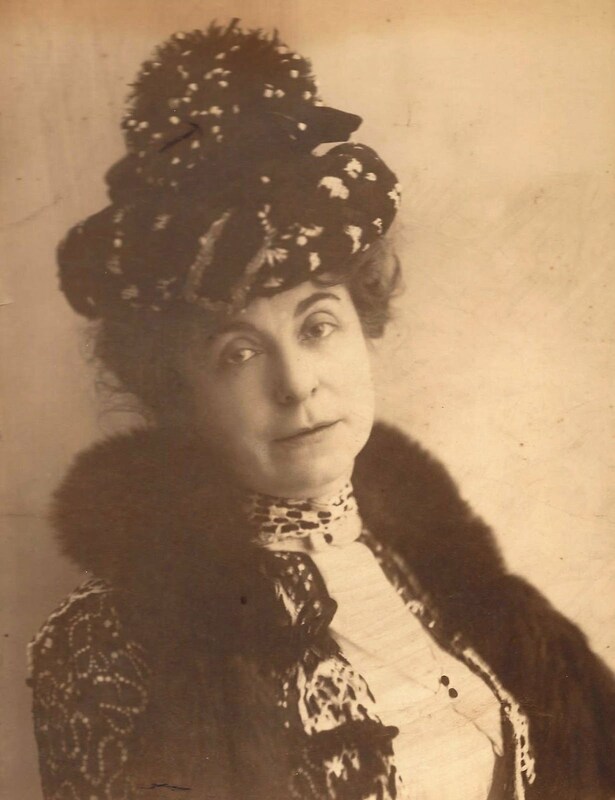 She married Henry Parker and the pair toured the Northeast with various theatre companies. In the 1890s, they returned to Oswego where Lottie penned the play which would go on to become one of the most successful and popular shows of its day. 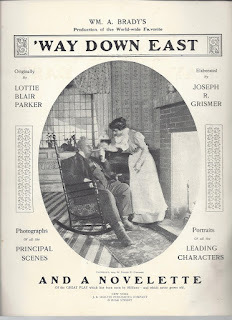 One of producer William Brady's original advertisements for "Way Down East." The story follows the arrival of a young woman, Anna Moore, on the doorstep of a New England family, disrupting their lives and casting doubt upon their future. Filled with love, mystery, chaos and humor, the production provides a fun and entertaining theatrical experience. Inside cover of souvenir booklet from original 1898 production. The production played in Oswego’s Richardson Theatre nine times as did D.W. Griffith’s silent film adaptation starring Lillian Gish. Now, audiences can see the original play on stage in the Frances Marion Brown Theater at the Fort Ontario Park Complex on East Fourth Street in Oswego. It will run on Fridays and Saturdays, May 6, 7, 13, 14 at 8 p.m. and on Sunday, May 15 at 2 p.m. Admission is $12 for adults, $8 for seniors and students. For tickets, reservations and details, call the box office at 315-343-5138. Memorabilia associated with “Way Down East” is included in the Richardson Theatre exhibit now on display at the Richardson-Bates House Museum, 135 East Third Street, Oswego. The exhibit will run through the remainder of the year. Museum hours are from 1 to 5 p.m. on Thursday, Friday and Saturday from April to December or by appointment. Admission is $5 for adults and $4 for seniors and students. For more information about the museum and its exhibits, call 315-343-1342.